I’m not usually quite that spontaneous, but I’d had enough of trying to play Kanata golf in conditions that required long underwear, ear muffs and duck boots. No more digging out plugged balls for me! I needed heat! 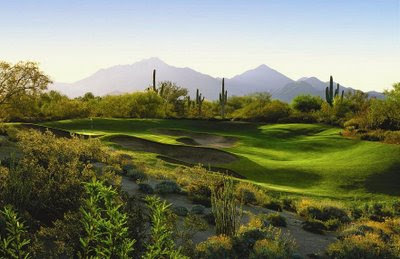 So after some research (AKA, chatting with golf forum buddies), we chose 4 great courses to play – the most highly rated of those being Grayhawk. Two weeks later, we arrived in Phoenix to a bit of a wind storm and cooler temperatures than I would have predicted, but I didn’t care. 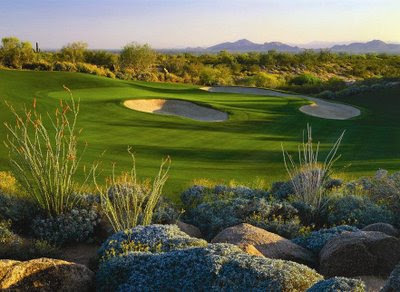 It was dry, the forecast was looking good and we were about to play at the home of the Frys.com Open – Grayhawk’s Raptor. A Tom Fazio design, The Raptor, is an immaculate golf course that is fair, but challenging, for players of all skill levels. The conditions of the fairways and greens were some of the best I’ve ever seen, and when you’re not looking down at your next shot, look up – the McDowell Mountains make a stunning backdrop. We started the day with a delicious lunch on the spacious Quill Creek’s patio, with gorgeous views of the 18th hole. While waiting for our food, I took a quick peek at the rest of the clubhouse facilities. I started with the women’s lounge. It was better than most I’d seen so far in my travels, with lockers and a shower area. In fact, I was quite impressed when I first saw it, but laughed at loud when I got a gander of the massive men’s locker room on the Gary McCord video tour on Grayhawk’s website, complete with attendant. Next to the men’s lounge, the women’s looks like a closet. Haha! Oh well…you can’t have it all I guess. After lunch, we headed over to the impressive practice area near the Talon course and were surprised to be greeted with very loud rock n’ roll blasting out of speakers camouflaged as rocks behind the tee boxes on the range. At first, I found this really annoying, but after a while, I got into the rhythm of it and found myself relaxing, swinging and humming to my favorite classic rock tunes. The range itself was large and very well maintained, with an endless supply of practice balls at each tee. I loved the short game area, with its very large practice green and lots of room for pitching/chipping and sand practice. It was not a surprise to me to read that the Grayhawk Learning Center was rated the #2 golf school in the US by Golf Magazine. Something I also noticed while warming up was the number of young men with headsets and microphones, driving around in golf carts, checking clipboards, chatting with starters and scurrying people off to their tees. I lost count, but there were a lot! Lucky for us, one of them noticed we looked “ready” before our tee time and bumped us up, without us even asking. He then escorted us to the starter who provided all the tips, tools and trinkets one might need on course, like tees, towels and ball repair tools. The only thing missing – GPS on the carts. I really could have used some “tips” from the tees. They do give you a card which lays out all the holes with yardages, but I am not one to pull those out standing in the middle of the fairway before my next shot (I’d have to pull out my reading glasses and that would be such a pain). 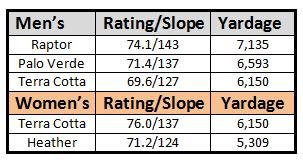 So, we used our range finder quite a bit on this course. The 15th hole is one of a few risk/reward holes on the course. Not only is it a short par 4, the green is downhill from the tee and a great drive can leave a short approach shot. But don’t get too cocky on this one. Wait until you get to the two tiered green and try putting that in two when you and the pin are on different levels. Grayhawk Raptor is a gorgeous golf course. The conditions of the fairways and greens were some of the best I’ve ever seen, and when you’re not looking down at your next shot, look up – the McDowell Mountains make a stunning backdrop.My husband and I were laughing at one point because even the tee boxes were pristine. But watch out for the deep and strategically placed bunkers on this course – they can gobble balls no matter what tee box you choose ;). The greens were beautifully groomed, rolled well and had lots of undulations to keep you guessing on your line. I never could quite figure out the breaks.When we returned home, I turned on the Golf Channel and discovered Gary McCord doing a Playing Lessons from the Pros on Grayhawk’s Talon Course. I wish now I had stayed an extra day to play that course as well. It looked to be in as great shape as Raptor and I’ve heard that it plays a bit easier (always a good thing in my books). Oh well, I guess another Arizona golf escape (or 2 or 3…) is in my future. 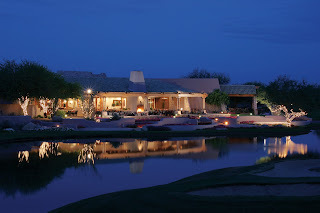 *Photos of Grayhawk courtesy of Lonna Tucker. Gotta love desert golf. What a great getaway that must have been!